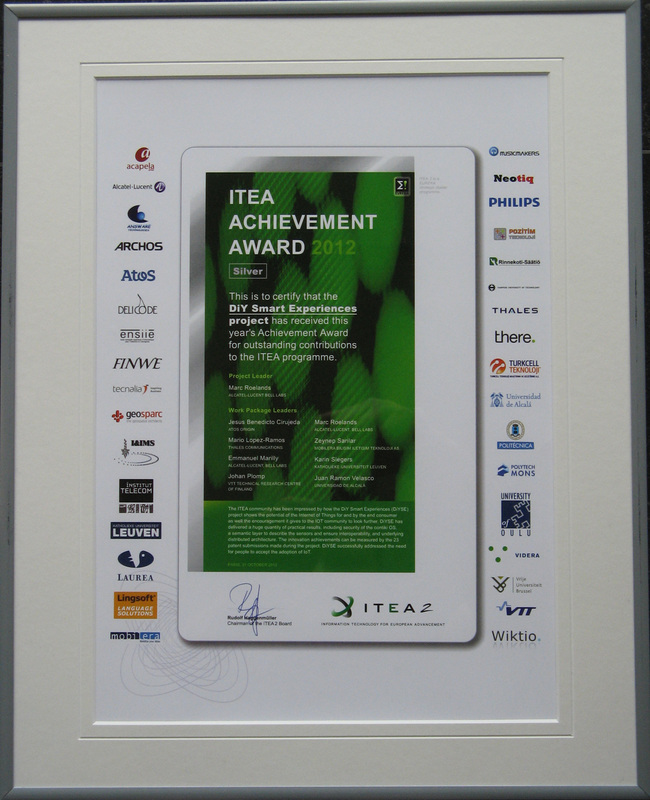 The DiYSE project was awarded the prestigious ITEA Silver Award 2012. Each year, the ITEA Achievement award highlights very successful projects with outstanding contributions to the ITEA programme. Major factors include innovation, exploitation and dissemination. As ITEA aims to make Europe’s industry more competitive, effective industrial exploitation of project results is crucial. The Internet of Things (IoT) marks the next major revolution in worldwide connectivity. The ITEA 2 DiYSE project has developed a technical platform to overcome barriers to user-generated IoT applications for ordinary people, developers and other ecosystem actors alike. Key outcomes are a live public experimental Internet site and a series of underlying technical assets, many already being exploited.